My relationship with nature deteriorated fast after I fell out of the tree. My family moved a few blocks away to a bungalow house across the street from a schoolyard. The grounds at Agincourt Road Public School were identical to those at every other public school, a concrete play yard inside an expanse of manicured lawn. The grass featured thin, weedy patches scraped by the foot traffic of children. I missed the field beside our old house, and my main outdoor activity became riding a purple banana-seat cruiser bicycle (it was the 70’s) around the neighbourhood. The summer I turned nine my parents gave me a Bug Catcher for my birthday. It was a glorified clear plastic cylinder with a pink plastic mesh top to allow for oxygen exchange. You were supposed to trap insects, pop them into this plastic prison, and examine their fascinating little bug parts. I picked three butterflies off the lilies of the valley in the backyard and successfully closed the lid on them. 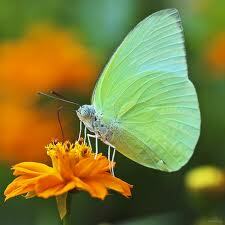 They were those pale green and yellow, smallish butterflies, the generic ones that don’t inspire gasps of pleasure. Lunchtime arrived, and I went inside. I forgot about the bug catcher. I left it on a picnic table outside, in the summer sun. I don’t know what I did that afternoon – listened to a Sean Cassidy record, perhaps. Watched an episode of I Dream of Jeannie. The next time I saw the Bug Catcher, my mother was waving it accusingly in my face, and she was furious. The butterflies were all dead, their delicate little bodies lying in a wilted heap. My crime was gross ignorance. Didn’t I know that touching the powder on its wings was a death sentence for a butterfly? How stupid was I, anyway? Just look what I had done. Dead butterflies, all my fault. I cried, I apologized, and I felt deep remorse. In fact, I felt bad about those dead butterflies for years. The powder on butterfly and moth wings is actually scales, infinitesimally small scales. Touching the wings removes or displaces some of the scales, but this in itself isn’t fatal to a gently-caught butterfly. A damaged wing structure will kill a butterfly, and butterflies trapped in jars will bash themselves against the clear sides of the container, attempting to escape, until they expire. Or maybe my three little everyday captive butterflies asphyxiated in the midday heat. This entry was posted in Katie's Posts.